Be the first to share your favorite memory, photo or story of LaDonna. This memorial page is dedicated for family, friends and future generations to celebrate the life of their loved one. LaDonna Sue Baldwin, 74, of Parsons, died at 1:20 P.M., Friday, January 25, 2019 at her home. She was born October 18, 1944 at Parsons, a daughter of Ivan Eugene and Virginia Lee (Shepard) Walters. She grew up in Parsons and attended school in Altamont, graduating from the Labette County High School in 1962. On February 16, 1968 she was united in marriage to Leon C. Baldwin at McCune. He survives of the home. She had worked at C.J.’s diner for twenty-five years, retiring recently due to her health. 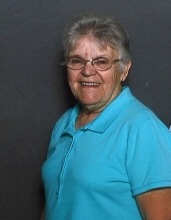 She enjoyed many friendships from her years of bowling and the Katy Golf course, where she served many years as President of the Ladies Golf League. In addition to her husband, survivors include: one son – Terry Baldwin, of Tulsa, OK; two sisters – Betty Ross, and her husband, Ronnie, of Corpus Christi, TX, Carol Frye, of Parsons, KS; one uncle – Billy Joe Shepard, and his wife, Jenny, Of Ft. Scott, KS; many nieces, nephews, sisters in-law and other extended family including the Baldwin Family. No services are planned at this time. Memorials are suggested to the Labette Health Foundation and may be left at or mailed to the CARSON-WALL FUNERAL HOME, P.O. Box 942, Parsons, KS 67357. Online condolences may be left at www.wallfuneralservices.com. To send flowers or a remembrance gift to the family of LaDonna Sue Baldwin, please visit our Tribute Store. "Email Address" would like to share the life celebration of LaDonna Sue Baldwin. Click on the "link" to go to share a favorite memory or leave a condolence message for the family.